Presentation for the IJMS conference. Paul N. Blezard MSc. It's more than a century since bicycles with bolted-on engines developed into 'proper' motorcycles. Since then, motorcycles have diversified into a beguiling array of diverse machinery, from rock-hopping trials bikes to touring behemoths; back-flipping motocrossers to 200mph MotoGP weapons. Engines can produce more power than even racers can cope with and chassis, brakes, tyres, suspension and electronics have all improved dramatically. Meanwhile, much simpler, cheaper, down-to-earth machines provide transport for the masses, especially in the third world. Yet cars have progressed much further; in recent years they have made dramatic progress in fuel economy, comfort, safety and overall running costs. By comparison, only the humblest commuting motorcycles are truly economical and in the first world at least, motorcycles are rarely more than mere leisure vehicles; practicality has largely lost out to pose value and performance; whether race-replicas or grand tourers, large capacity bikes are mostly just big boys' toys. 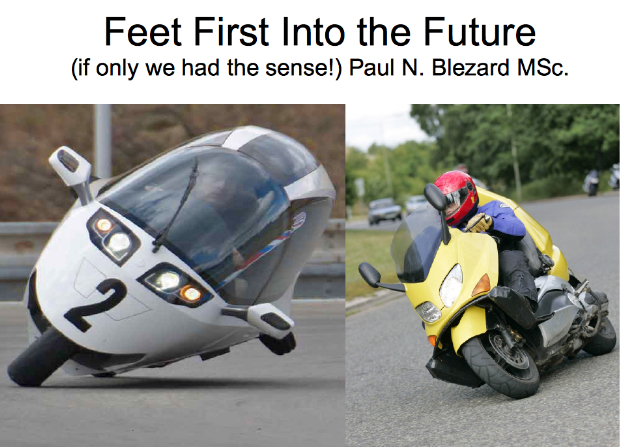 This presentation describes, (with real-life past and present examples) how the wider adoption of a 'feet first' riding position and other car-like features could enable motorcycles to become safer, more practical and more economical vehicles (especially in the burgeoning field of electric power), without being any less fun to ride. Submitted by Royce on 29-Aug-13 8:58am. Will we get to see this presentation? Who is the IJMS? In the smaller world of TLA's (Three, not four, letter acronyms) the TSB's NVN* has just turned down a funding request for a 2015 E-GP FF entrant - reasons revealed mid-September - in favour of electrifying the Morgan sports car and funding a three-speed E-motorcycle gearbox for people who apparantly haven't heard of Hewland Engineering or David Brown. As the NVN is supposed to be supporting "Disruptive, Low-Carbon vehicle technolgy" I would suggest that it isn't "We" that lack sense, or the courage to progress obvious, logical and appropriate innovation, but apparantly respectable outifts like the TSB. Not to forget Honad, BMW and their fellow motorised bicycle makers. With numpties like this controling investement in innovation it will probably be more useful to translate the above presentation into Chinese, but quickly, before their pre-conceptions become set in stone too! *NVN The Niche Vehicle Network, spending £341 million of English taxpayers money, for the TSB, The Technolgy Support Board (With another Billion to unload). The boss of the NVN was not aware of the recent Efficiency X-prize, where the Peraves-derived X-tracer FF produced the best fuel efficency. Submitted by Royce on 31-Aug-13 12:56pm. OK, so I've done the right thing and found the IJDMS site. And what an avalanch of claptrap and mystique mongering it is! Look no further for proof that 'motorcycling' is doomed. Also failed to find Pauls presentation in 'Current' or 'Archive', possibly due to my incompetence in navigating the site, possibly because it isn't up yet. If Pauls Abstract represents the tone of his presentation it'll be the most rational piece on the site, and a good example of what FF proponents do far too much of - casting pearls before swine. Full marks for effort though! For an example of the actual concerns facing the PTW industry, look at what Triumph are up to in my own neck of the woods;- http://www.bristol.ac.uk/eng-systems-centre/idc/projects/timhutchinson.html "Regulatory pressures closing in on motorcycles" indeed! I know of much better ways they could achieve their aims than Bristol Uni. (Not one of the known centres of Power Management expertise) but they'd have to answer my emails to find out about that! In any case I hope they succeed in producing a practical EFV powertrain for their motorcycles - I'll be able to buy one second hand and go faster, further with it in an FF.